To graduate or not -are job opportunities become scarce in SA? IF ECONOMIC opportunities are not going to bear fruit in South Africa, the rate of unemployed graduates is going to increase and exacerbate the volatile situation already. Demanding sustainable jobs. Graduates from all over the country marched to Unions Buildings and handed memorandum to the Office of Presidency demanding job opportunities yesterday. 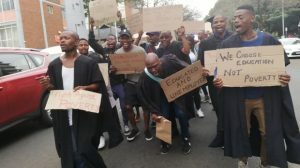 On Tuesday graduates from all walks of life descended at the Union Building in Pretoria to hand over a memorandum of demands to the Presidency. Graduates under the banner #HireAGraduate, demand better and sustainable jobs from Government. They claim the education system is failing them, saying they were told to get qualifications for a better life but instead they are still swimming in poverty. Graduates also demand government to create internships for graduates to gain experience. Nkululeko Ndlovu (28) from KZN said since they were born, they were told education unlocked many doors to success and a way out of poverty but that was not true. “Instead of getting employment, we are just sitting at home as if we are not educated. “We need the government to create jobs for us, right now there’s a huge number of depressed young people in the country and one of the things leading to depression is having all the qualifications but not working,” he said. Some clad in their graduation regalia, the unemployed graduates ranged from teaching diplomas, B-tech accounting, economics degrees and fine arts diplomas, amongst them. The #HireAGraduate campaign started last year as statistics revealed that there were an estimated 9.3 million unemployed citizens of which 6 million were those under the age of 35. The question now is, is it worth to go all the way to graduate only to find yourself unemployed especially those from the disadvantaged background? Yes, Government alone cannot create jobs but private sector has to come on board as part of Public, Private, Partnership (PPP). Analysts, economists, financial commentators are of the view the only way to curtail such situation is by creating SMMEs, in this case one will be a job creator instead of being a job-hopper. With national elections in 2019 the ruling party should address this matter as quick as possible or this could have a serious dent on their campaign.